Adoral view of Phymosoma koenigi, from the Natural History Museum. 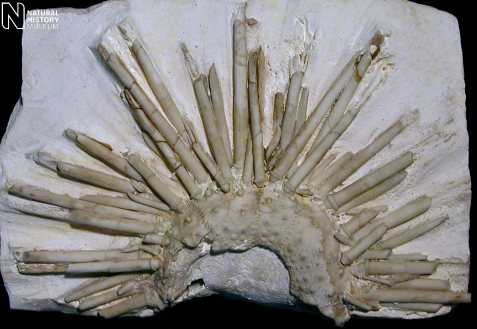 The Phymosomatoida are a group of echinoids known from the Lower Jurassic to the present, characterised by the possession of a stirodont lantern and imperforate primary tubercles (Fell & Pawson 1966). Characters (from Fell & Pawson 1966): Lantern stirodont. Apical system lacking large polygonal suranal plates, not simulating calyx. Primary tubercles imperforate. Ambulacral plates simple throughout, or (more usually) compounded in diadematoid manner, trigeminate or polyporous. Fell, H. B., & D. L. Pawson. 1966. Echinacea. In: Moore, R. C. (ed.) Treatise on Invertebrate Paleontology pt U. Echinodermata 3 vol. 2 pp. U367–U440. The Geological Society of America, Inc., and The University of Kansas Press.